I enjoy working out with kettle bells, and find her workouts fun and easy to follow. Especially like her hip circles between exercises, great idea. Good short workouts that let you get exercise in when you don’t have a lot of time to do other workouts. Need modified things to do instead of the split squats though – have had knee surgery and can’t do deep knee bends anymore. I am a male certified personal trainer through ACSM and am currently studying to be a certified strength and conditioning specialist (CSCS) through NSCA. While I have enjoyed some good male trainers, such as Michael Skogg and Pavel Tsatsouline, since first working with kettle bells in 2011, and more recently Keith Weber, frankly, I was tired of looking at a bunch of dudes training doing what I enjoyed and was hoping there could be a good (aka tough, technical, and not afraid to go heavy) kettlebell training DVD of an attractive female instructor as a way to change things up further in my workout routine. Lauren Brooks’ “The Kettlebell Body” definitely fulfills this niche; I have thoroughly enjoyed it! In fact, I have it readily available in my “go-to” training stack of DVDs. I like the way she combines her attractive female form and excellent kettlebell knowledge base and applies it to this classy and professional-looking kettlebell DVD that would be more than sufficient for anybody, including men! 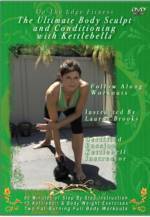 Her DVD has excellent step-by-step demonstrations of how to perform 12 key kettlebell exercises. Many of the existing female instructor kettlebell DVDs are really meant for only women – they tend to go easier, use lots of calisthenics, and so forth. I am sorry, but I recognize these for what they are and know they are not meant for me. But, I love Lauren’s material in that she stresses the importance to go heavy, plus her kettlebell exercises are purely hard-core! However, her DVD includes three complete workouts that cover both definition/endurance and power. Ironically enough, I use this DVD’s workout titled, “Kettlebell Body” over any of the other male-instructor workouts I have when I go for my power workout days!! I truly believe you will appreciate this quality kettlebell training DVD; I am an older/middle-aged male who has lifted weights for the past 34yrs – I respectfully admire Lauren and her excellent instruction and training! I have all of her videos and rotate through them almost every day. I love her teaching style and superb knowledge of form and technique. This is my favorite dvd of hers by far. It is more focused on strength than conditioning, however I am still huffing and puffing my way through it every time! I am an ACE certified personal trainer, group fitness instructor, HKC certified instructor. I mainly train ladies and my tool of choice is the kettlebell because they get the most ‘Bang’ for their time and dollar. I have a small group of ladies I train weekly and Lauren’s ‘The Kettlebell Body’ provides me with fresh ideas for the group and a great workout for me. I really like her use of ‘Ladders’ and Timed Intervals. My own workout? Her exercise choices are just the right mix. I have plenty of other Kettlebell DVD but they are too much or too little. Lauren’s interval seen to be just right; by the time you want a change, it’s over and time to move to the next exercise. This is my first DVD by her and I am planning on the ‘Kettlebell Lighting’ DVD next. I owed 2 of Lauren’s DVDs – the ultimate body sculpt volume one and and two. For many out there these DVDs may be no problem, well they would not have been for me either if I would not have a weakness in my left shoulder. I could never followed the section to the end because of the pain in shoulder and shoulder not wanting to do the things I was asking it to do! Even with physio – it never has gone away, I guess I will have to live with it. I took the plunge and bought the kettlebell body and wow I’m amazed. I CAN do these exercises!!! the option of changing the to a different bell is a brilliant solution to my problem. Going heavier on the swings for instance suits me fine. The DVD is not a easy, light weight or not tough enough DVD. If its not making you sweat then you are not using the right bell. I LOVE THIS DVD! You wont regret – get it. do the whole DVD or one section at the time, make it work for your time available, its awesome just like its presenter. Bye the way I also love the new ”warm-up or cool-down”, imagine going back to your childhood where you would crawl, what a simple idea, but it works. THANK YOU LAUREN! Great DVD with three workouts that last about 20-30 minutes each. The time flies by. I really love Lauren because the pace on the videos isn’t rushed, and she really focuses on form. I have disliked other videos I’ve purchased because they rush through the movements and transitions, and it can be hard to keep up. I feel energized after each of these workouts and not worn out. My wife and I learned some kettlebell basics from the owner of a CrossFit Gym who also happened to be RKC II, but they were never really the focus of our fitness. I preferred barbells, and as a lifelong swimmer, she loves the pool. A few months ago though, I decided to explore the world of kettlebells, and may never turn back. I’ve been doing Pavel’s “Simple and Sinister” program, but going to a local kettlebell gym on Saturdays for the coaching experience and also a little variety. And with that goal in mind, I emailed Lauren to see which DVD she’d recommend for exploring all of the basic kettlebell movements and adding some of that variety to my kettlebell life. She wrote back to recommend this one. Coincidentally, my wife was interested, too. Looking through all of Lauren’s DVD’s, this was also the one that really appealed to her too. Let me tell you, we both love it! The workouts are phenomenal. Ok, ok, I’ll be honest. I haven’t tried Kettlebutts, but Kettlesculpt and Kettlebell Body are both great. I think they blend strength and higher intensity work perfectly, without taking either too far. I’m definitely interested in Lauren’s other DVD’s now, but honestly, this one really seems like everything you need. I’ve been working out with Lauren’s new dvd, The Kettlebell Body, after using her first 2 intermittantly for the last 4 years. Those first two got me in amazing shape, with only (3) 20 min workouts/week, so in my latest quest to get back to working out and lose weight, I was so excited to hear she had a new dvd coming out. I LOVE THIS WORKOUT. Its different than her first 2, but in a really cutting edge, great way. I seem to keep being drawn to the kettlebell body routine of the three routines offered on this dvd. If you use heavy enough kettlebells you WILL get great results with this. I love the “less is more” design, with the encouragement to go heavy but relax between exercises. This workout takes kettlebell exercise science to a new level, at least in my world! Combined with a healthy, whole food and low fat diet, anyone can get in great shape with Lauren’s kettlebell workouts fast. I heard a saying that is so true: we lose weight in the kitchen, we get fit in the gym. Keep that in mind and by using Lauren’s KB workouts only 3 times/week you will get in the best shape of your life. And they’re FUN! Thanks Lauren and team. Can’t wait to see what you do next! I’ve been using Lauren Brooks’ products for a few years. I have her Volume 1 and 2 DVD, her book, Kettlebell for Women, and her program called, BeSlam, available from her website. This is an excellent strength program. This DVD is focused on strength. Her previous DVDs are a combination of strength and cardio for efficient calorie and fat burning. This DVD is different. The goal is strength. For me, this is perfect. I run, so I get plenty of cardio. For right now, what I want is a strength training program that I can do at home. I enjoy using the kettlebell for strength training, and Lauren’s products have helped me make solid strength gains. You can use this in combination with her other DVDs in order to mix up your routine, or you can just use this to work on your strength goals. The DVD covers the basics. There are not complicated exercises, but they get the job done. I find the DVD motivational and effective. And one more word. The DVD features “real” people, not actors or people who do this for television. Lauren is a certified kettlebell trainer, and with her are people who are training. Other fitness DVDs can come off as more polished, but this one is focused on a solid workout and demonstrating proper form. It is very important to have correct form when you handle weights. I have been using this dvd as a filler workout when I cannot make it to the gym. It is exceptional & a super workout. I have tons of fitness dvds. I consider myself an expert. This was my first KB workout and I absolutely love it! I started with a 20lb and am now using a 35lb. I really appreciate the section which clearly explains how to do each of the moves. You shouldn’t start the workout until you’ve practiced each move in the instructions. I enjoyed this dvd better than the one that came with my KB because it was very fast and not enough attention to form. Whereas Lauren is all about form and strength. In about a month or sooner, I will be ordering one of her other dvds so I can rotate them and start a nice collection. I highly recommend this dvd for all levels. Let the weight of your KB determine your level of skill: beginner, intermediate or advanced. Always the best when it comes to form and instruction. I went to see a trainer after using Lauren’s video for a month, and he couldn’t find anything wrong with my form. Practice the moves exactly as she does, and you will see yourself transform. Lauren’s workouts rock! I have all of Lauren’s kettlebell DVDs. This one is by far my favorite. I love the idea of less reps and heavier weight. There are three separate workouts along with a warm up and/or cool down. I workout at 4:30 a.m. each weekday morning and this DVD allows me to workout in a short period of time with maximum results. I look foward to Lauren’s next DVD with this type of format. Lauren, you continue to be my inspiration. Thank you! Lauren has done it again. I love the fact that there’s no timer & it’s at your own pace. You can use heavy KB & which I’ve done & I always get the good kind of sore the next day knowing I worked my body good!. I’m inspired with the women in the DVD of different ages and doing the damn thang. Keep up the gr8 work Lauren. I just never get tired with her workouts. I can’t wait to download it on my phone when it becomes available. I love this DVD so far! It is a great workout that does not take too long. I can just do the 22-25 minute section or more for a longer workout. I feel stronger each week. Great one to lose weight or tone up. The impressive thing about this DVD is that it doesn’t get boring. The workouts are challenging, mixing body weight exercises like pushups and walk-out to pushup with kettlebells and “active recovery” (stretching). I haven’t gotten bored. If things get easy, I just move up to heavier bells. I’ve been setting goals and hitting them faster than I would have thought. I can do the turkish get up with 26 pounds which I would not have thought possible six months ago. Six months ago I was using half that and my arm was wobbling. I love, love, love the warmup. I do it on my offdays as well because it’s just a good mix of stretching and body weight exercises that you can do anywhere. When you combine the warm up and the extended workouts you are looking at about 45 minutes, which is long, but not impossible. I do those on week-ends when I have more time. Before work I do the warm-up with with the main work out and skip the “finisher” if I don’t have time and still feel I’ve had a great work-out. These are definitely metabolic of HIIT style workouts. I feel energized all day after doing these.